Christmas is two days away. 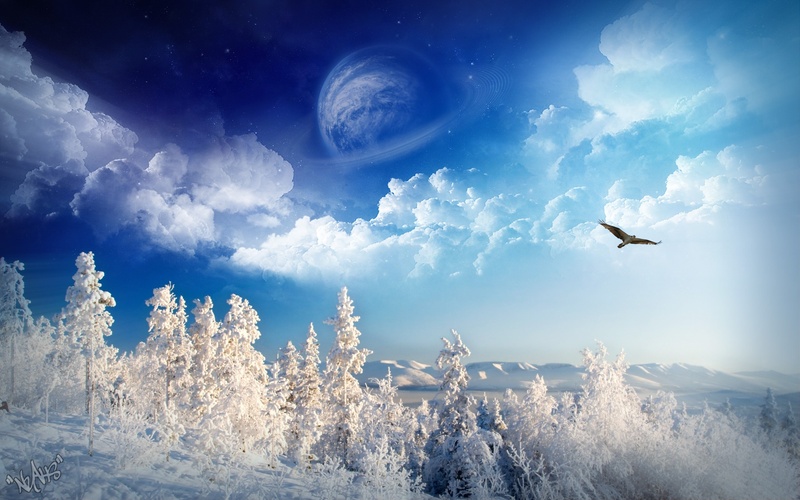 New Year 2016 is on the horizon. I find myself reflecting upon this blog and deciding upon a direction to take. Most of this year has been devoted to the Spence line. I had been promising it to people, but I needed to update my data first. So the task of updating the information and writing it down has been significant. Now with Spence completed, I am pondering what to do next. And several lines are awaiting my attention. Since completion of the Spence line in September, I have written some articles pertaining to my father’s Inman line (the Paine connection; the Snow vs. White controversy; and the Clines). I had made some discoveries about those lines I couldn’t wait to share. However, I’ve made significant discoveries in other lines as well, which I am anxious to share. Howard’s Beall and related lines also beckon my call. Making a long story short, I have a lot of stories to tell. For that reason, my focus in 2016 will not be one-directional. The articles on this blog are linked to categories in the menu by family surname or by topic. I devised those categories while working on Spence. And they seem to work well with what I am doing. I prefer the article format over writing a book. Books have a life spam and are expensive to do. Articles are more flexible and easier to complete. So I do not plan to write any more books. But I will be writing tons of articles. Wishing you all a blessed Christmas and a great 2016! This photo was taken last fall before Brian’s cancer surgery. He thought the disease was over and gone, and he had even been cleared to return to work. Well, guess what happened? Some of those nasty little cancer microbes hid from the treatments and returned with a vengeance. He is now back to Stage 4 Terminal again. The doctor told him he wasn’t giving up on him. Neither are we! Brian begins his treatments again this week. He is not going to be able to return to work, and he has another big battle on his hands. Our daughter Debbie set up a GoFundMe Project to help her brother. Anything you can do will be sincerely appreciated. Meanwhile, keep Brian and LuAn in your thoughts and prayers. 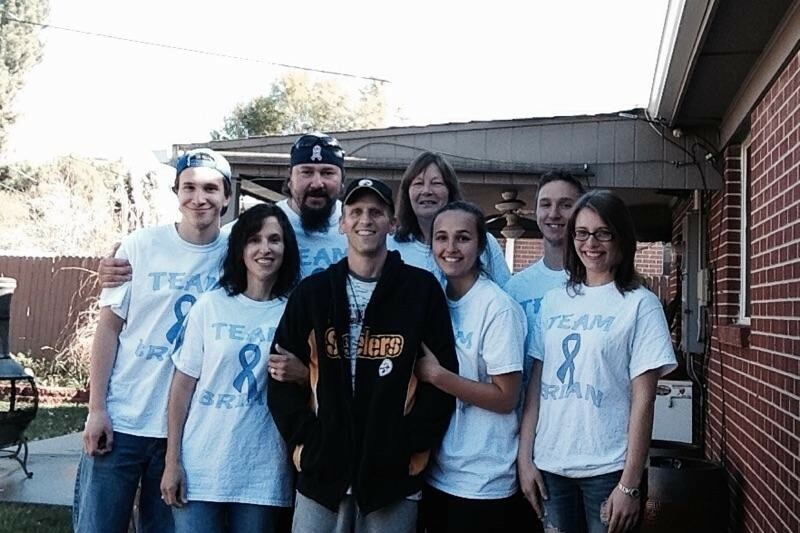 We just learned that Brian’s cancer has returned with a vengeance and are asking for prayers for him. He underwent surgery for esophageal/stomach cancer last October. They were able to get all the cancer they could see. Then he underwent chemotherapy treatments for five months (January-May). That worked as well. They found some cancer cells that were trying to come back and the chemo destroyed them. All looked good. And now it is back again and he is back at Stage 4 Terminal (where he was last summer). 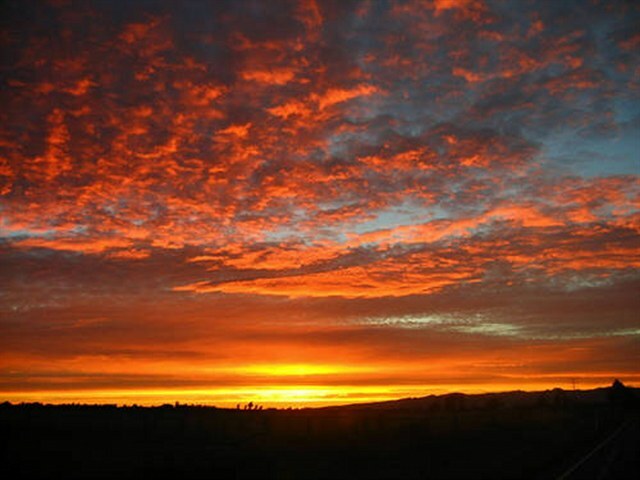 This is a particularly aggressive cancer–but God is more powerful than the disease. Howard and I believe that God has a special plan for Brian. This is a part of the plan, and I believe this disease can be defeated. Therefore, we are asking for prayers. He was in the hospital all last week–something we didn’t know about. (Our kids have a habit of keeping things secret from us.) Then he needed a ride home on Friday. He had a mass in his kidney–something related to scar tissue from his surgery. They also had to drain off two pounds of liquid from his lung–and they found cancer cells in that. He was really glad to see me when I opened the door to his room. So now he is back on the prayer list. He said he as going to need tons of prayers. Howard’s treatments for prostate cancer proved fruitful this spring. 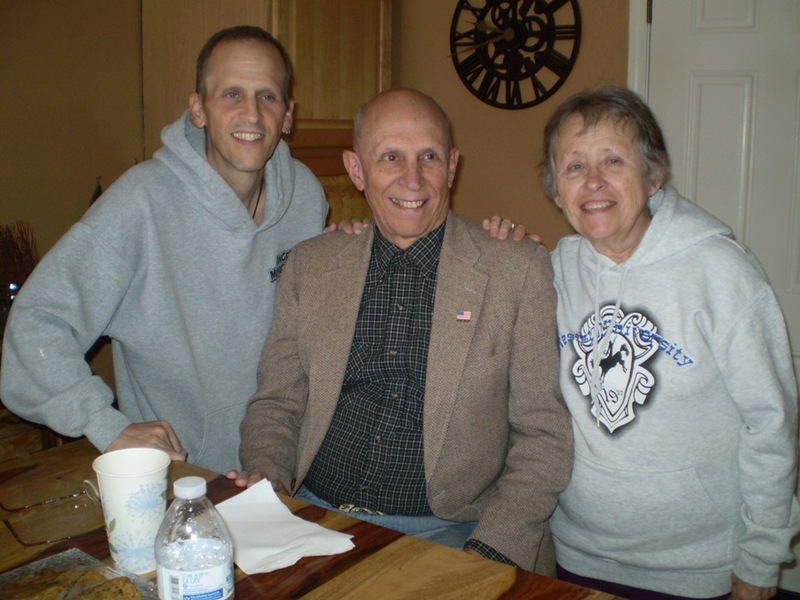 He underwent radiation treatments; the cancer is gone. He just lost a good friend to the dreadful disease this week, but his friend was diagnosed five years ago and did nothing about it. He was a dentist! (What is the old saying that doctors and dentists make the worst patients?) He did nothing about it for five years until he couldn’t walk. Howard met him at the cancer center. Two of a kind, they bonded immediately and their friendship remained strong until the friend passed the other evening. Now, we aren’t prepared to lose our son! There is a cancer gene in the family–something that was determined when our daughter had breast cancer several years ago. She had a double mastectomy and is on anti-cancer drugs and is doing great. And now the horrible disease is plaguing our son. Please keep him in your prayers. 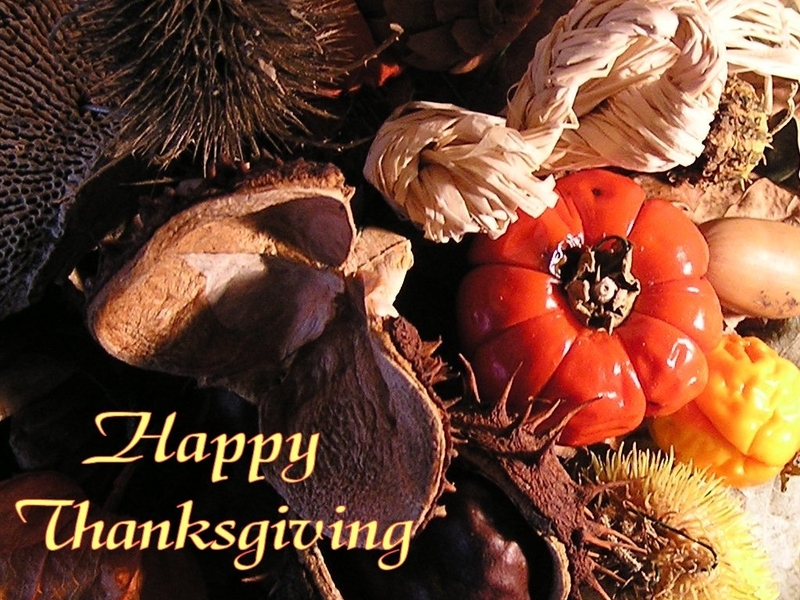 We thank you! Back in September, I was busy making my doctor appointments for my annual visit. I had scheduled my doctor’s visit around October 7 or 8. And I thought–wouldn’t it be great if I could get my eye visit the same day. So I asked about it. No, they told me. They had no appointment available at that time. The earliest appointment I could get was 8:40 A.M., November 28th! I wasn’t too happy about having an eye appointment the day after Thanksgiving. After all, Howard and I planned to go to the Cracker Barrel and have a feast on the holiday, etc. It would be nice to spend Friday at home. Plus, Howard had some errands planned for Friday. However, after learning the next available eye appointment was late January or early February, I went ahead and took the 28th. I wanted to get it out of the way because it had been four years since my last exam. Howard became ill that day. He actually became ill the day before when his stomach started hurting. By yesterday, the pain settled on his lower left side. We cancelled our plans for the Cracker Barrel, and I fixed a dish here at home. In short, we didn’t go anywhere. And by evening, he was still in pain. When he woke up with the pain yesterday morning, he decided to do something about it. After all, I had an eye appointment at Kaiser. He would try to schedule an appointment for himself with his own doctor. And he was able to secure that appointment. By 8:15, we were on our way up the road to Kaiser. My eye appointment took about an hour. 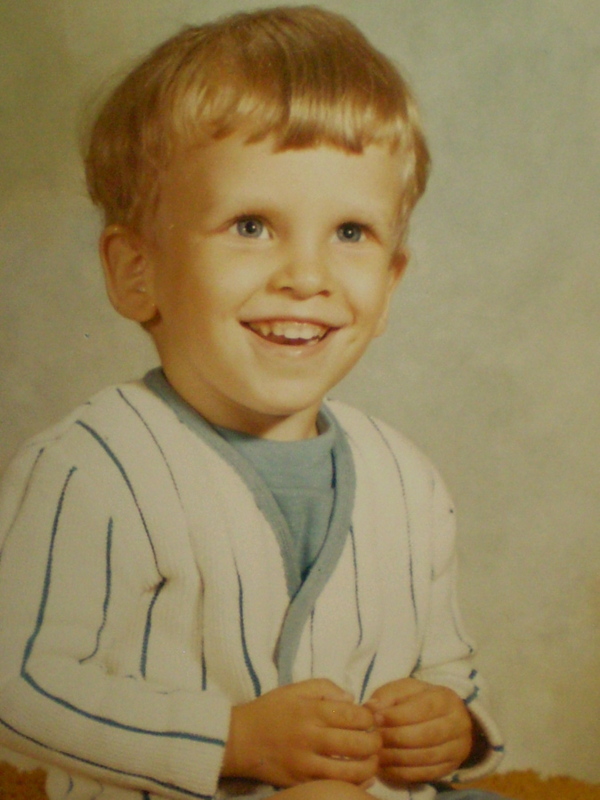 Yes, my eyes had changed a bit and no, they hadn’t changed too greatly. I have cataracts on both eyes, but they haven’t reached the point as yet where they require surgery. They dilated my pupils, so I was seeing double for a while. I left the eye department and headed up to the 4th floor where the primary physicians are located. I sat down in the waiting area and waited. Presently, I heard the door open and saw Howard. He had been diagnosed with diverticulosis. The doctor prescribed medications for him, so we had to stop at the pharmacy before leaving the building. Then we had to stop at the store because Howard needs to follow a liquid diet until he feels better. Of course, I spotted a poinsettia at the store and returned home with it. Fast forward to later yesterday afternoon. Howard definitely felt better last evening. I honestly believe that had I not had that eye appointment yesterday morning, he would have put off the doctor and that would have resulted in surgery or worse. I firmly believe the hand of God was involved back in September when I scheduled that eye appointment. All things happen for a reason. And that reason is apparent here! My writing is on hold this week, and I will return to the Spence articles after my son’s cancer surgery is successfully completed. This old throwback picture of him was taken in 1971, so he was almost three years old at the time. He goes in for his surgery Wednesday. I will get back into the writing mode after the surgery is successfully completed and after he is on the mend. He’s really been upbeat and has built himself up well for the procedure. Now that his esophagus has healed from all the radiation and chemo, he’s able to eat a lot more things that he couldn’t eat before. It could be a seven-hour operation and he could be in the hospital for 10 to 14 days. Another thing that has given him an emotional high is the fact that his beloved Kansas City Royals are in the World Series. As a general rule, my front window sill is blanketed with flowers. From September until April or May, two Christmas cactus plants peer through the front glass. They spend the warmer months in the basement where it is cooler. I used to keep them out in the back yard during the summer months, until a cat fight spread one of them across the grass. Since then, they spend the summer in the “Underground.” One of them–the large one–belonged to my mother. Howard gave me the smaller one when it was tiny several years ago. He rescued it from the local super market for $1.00. The flower clerk actually sold him two plants. He brought them home. One–and I forget the name of it–died. The Christmas cactus survived, however. It gets bigger each year. 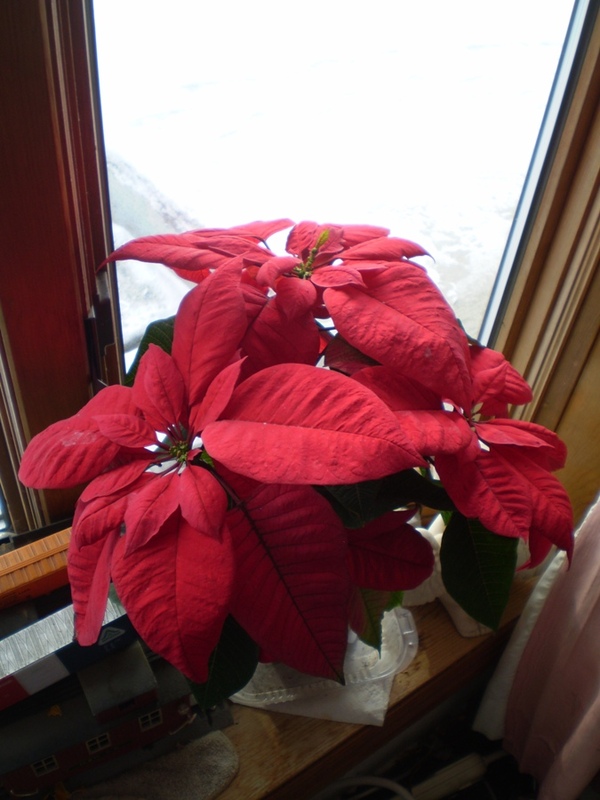 And my window would not be complete each year without a poinsettia. 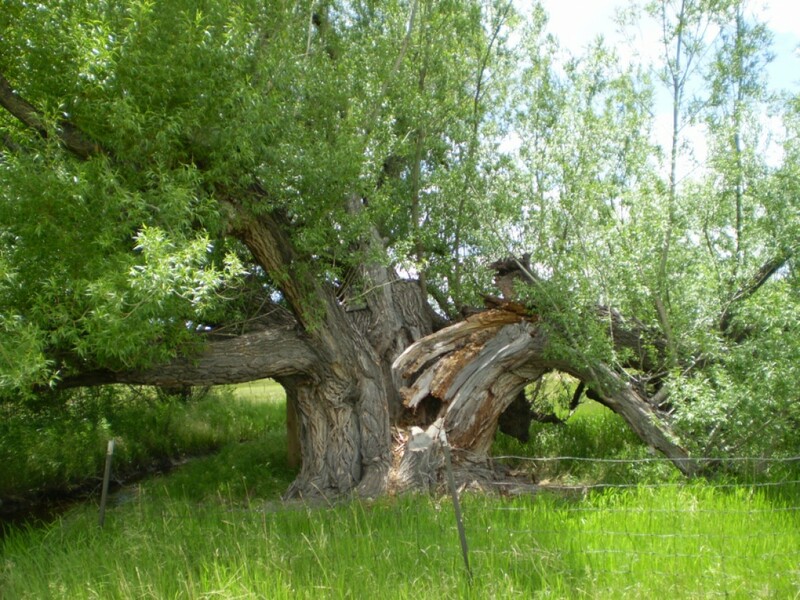 The current resident–purchased in Walmart’s December 1–is still quite beautiful and happy. 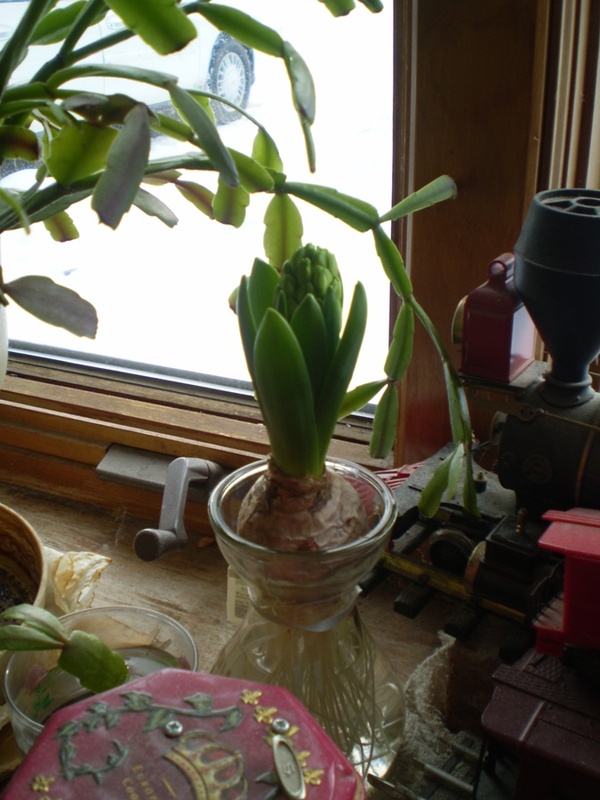 The plant will stay in the window until the Easter lily arrives. Then I will move the poinsettia to a different location. Yesterday after church, we struggled through the ice and snow to head over to Home Depot. Howard is doing a minor plumbing job in our kitchen, and he needed to have a small pipe cut. I elected to go to the King Soopers store next door in search of a couple of items. A table of plants greeted me as I entered the store, and I was instantly drawn to a table of hyacinth plants for sale at $4.99. The table had been covered with them. I stood there looking at the remaining four or five. 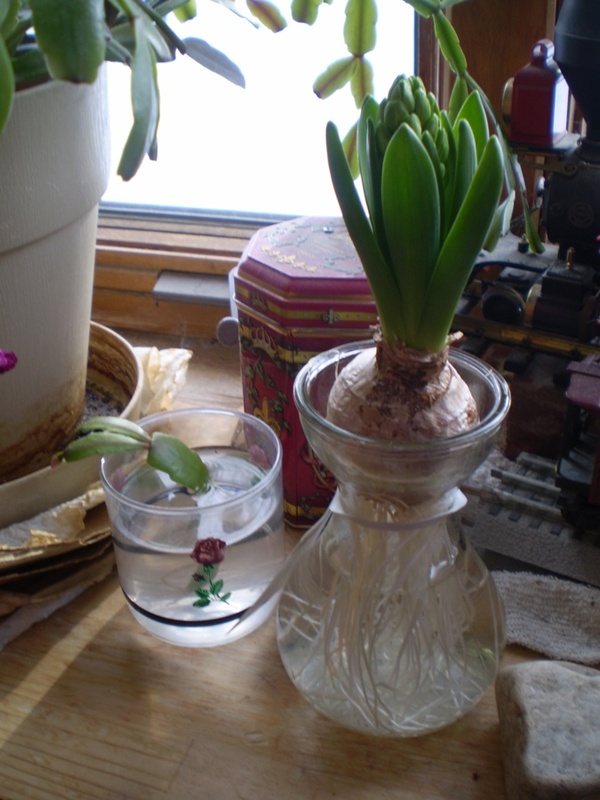 These little plants consisted of one bulb inside a glass container filled with water. 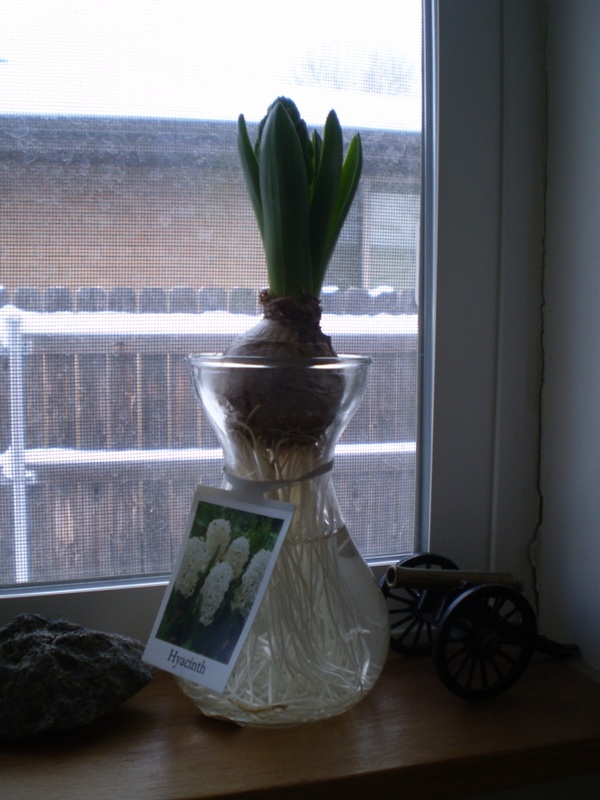 The bulbs each had an amazing root growth, and all of them had the beginning of a hyacinth growing from the top of the bulb. Two of them had great starts in the flowering phase. I chose one of those. The instructions for keeping my new friend? I had to make sure the water level was 3/4 full. I had to keep it in a cool room. And the room needed a lot of light. So finding the right location in my house was a challenge at first. The plant didn’t like the “underground”–too dark. And it didn’t like the “Gold Room.” Too cold. Besides–I couldn’t see it in those locations. The hyacinth finally ended up in my front window with the two Christmas cactus plants, a tiny version of the larger plant I am trying to root, and the poinsettia plant. After all–it is 1 degree above zero outside this morning, and it was below zero last night–so the “cool” requirement was certainly met in that window. 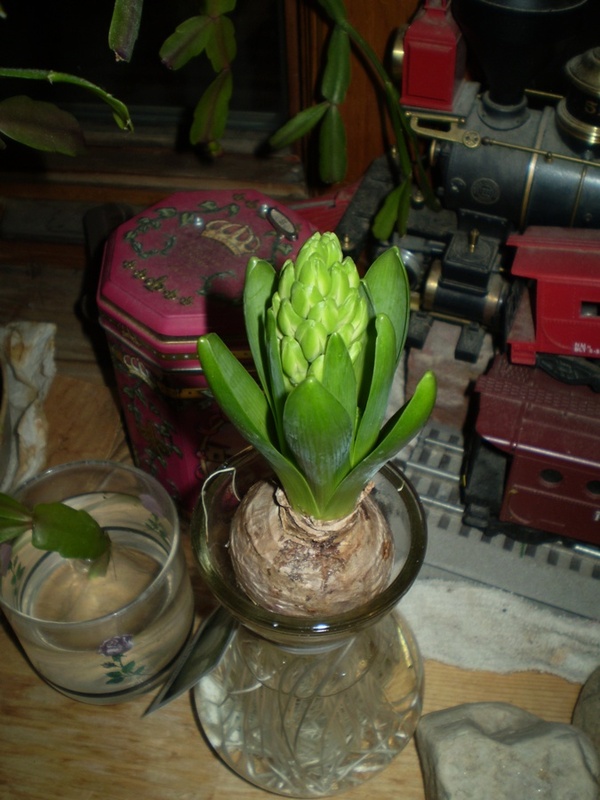 When I awakened this morning, the hyacinth said “Good morning.” The leaves are beginning to open, and the flowers are beginning to form! The plant really loves the window! Can hardly wait for it to bloom!